Mahi-Mahi is one of the fastest swimming fish in the ocean, traveling most often on its own. They are also known to grow very quickly (averaging 5 pounds per month) but their lifespan is typically only three to four years. Some say Mahi-Mahi is one of the most beautiful fish in the ocean because of its iridescent colors. 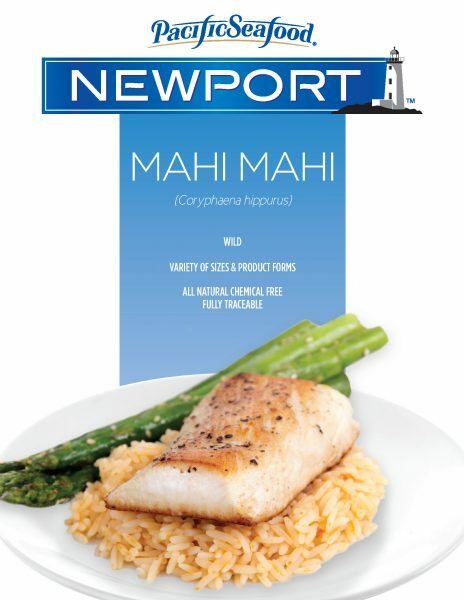 Mahi-Mahi has lean flesh with a mild, sweet flavor profile, moderately firm texture and large, moist flakes. Fresh Mahi-Mahi has translucent pinkish flesh and a bright red bloodline. The skin is thick and should therefore be removed before cooking. The strong flavor of Mahi-Mahi does not require many additional spices or seasonings; a light coat of lemon or garlic butter is recommended, it is excellent as fish and chips as well.